Having long admired Grandmother’s Flower Garden quilts, Corey was excited to come up with a technique that allows us to piece a quilt that looks like a Grandmothers Flower Garden quilt without all the fuss. No hand piecing, templates, or specialty rulers are required. 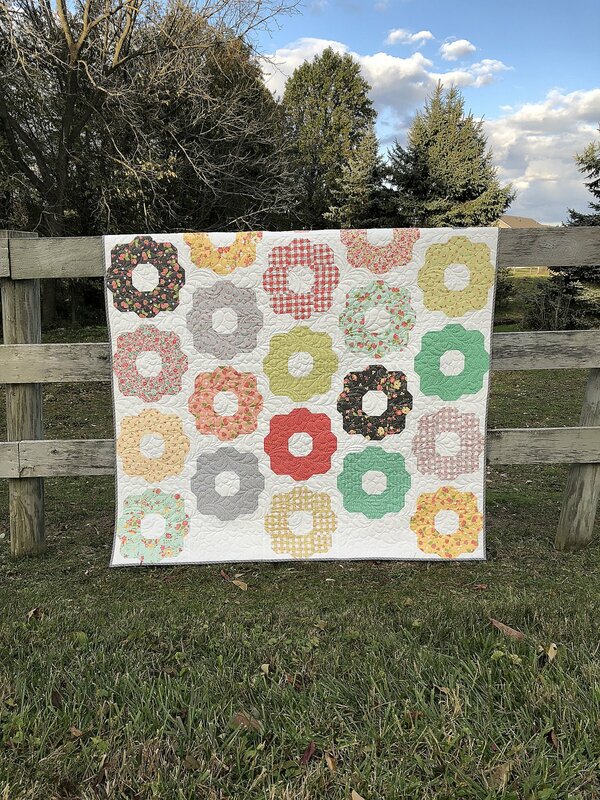 Beholden uses regular piecing methods and these blocks come together beautifully to recreate the look of a Grandmother’s Flower Garden quilt without the time traditionally spent piecing these beautiful quilts. Materials Included: Instruction and pattern included. Requirements: You will need to bring your sewing machine, supplies, and fabrics that have been pre-cut according to pattern instructions. A supply list will be provided upon registration. Instructor Bio: Corey joins us for Quilt Weekend Maysville as our special guest for 2019. Corey designs fabrics for Moda, and patterns for her own company, Coriander Quilts. Her aesthetic is bright and happy, and she regularly exudes her love of fabric, quilting, and finding beauty in the simple things via books, magazines, and social media posts.